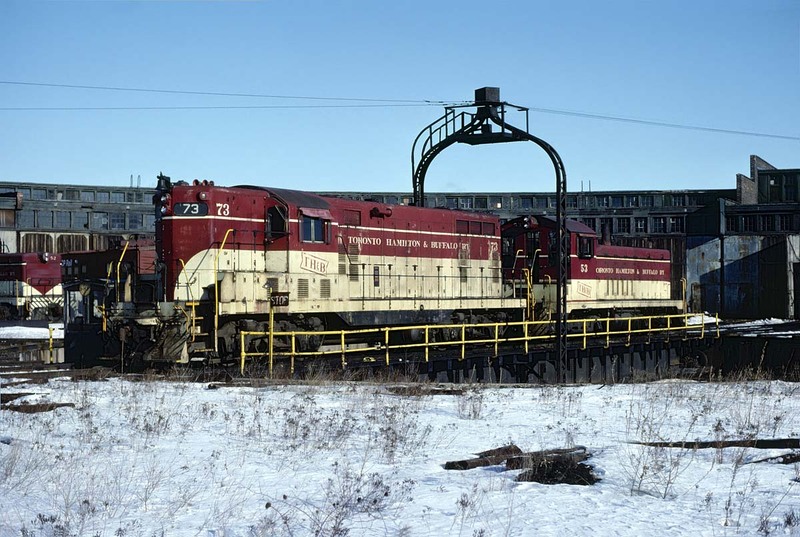 Railpictures.ca - Dave Beach Photo: TH&B GP-7 #73 and NW-2 #53 share a ride on the Chatham Street turntable on February 28, 1982. Both units wear the road’s attractive cream and maroon paint that the first diesels delivered in 1948 wore. #53 was part of that order. The TH&B is one of the few roads to keep a consistent diesel paint scheme for such a long run (1948 – 1987) | Railpictures.ca – Canadian Railway Photography – photographie ferroviaire Canadienne.